There are few studios that have the sort of blemish-free record that Studio Ghibli enjoys. With pictures like My Neighbor Totoro, Grave of the Fireflies, and Spirited Away, the studio has contributed to my adoration for animated cinema. 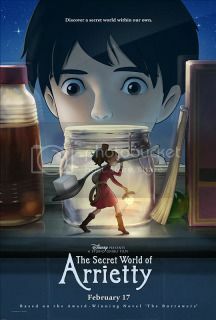 Scripted by Studio Ghibli’s co-founder and anime legend, Hayao Miyazaki, The Secret World of Arrietty had the characteristics of being yet another feather in the studio’s cap. Unfortunately, it comes with a heavy heart to say that I wasn’t all too impressed with Hiromasa Yonebayashi’s debut directorial feature. As I look at Studio Ghibli’s output, there are some clear distinctions between the pictures they make. They all tend to have a melancholic tone, but some pictures are more laconic and subdued than others. Films like Princess Mononoke and Castle in the Sky are more action-oriented than Whisper of the Heart or My Neighbor Totoro, which encompasses a more meditative approach. I prefer the latter. So it’s a bit surprising that I didn’t take to The Secret World of Arrietty as much as I thought I would – it’s as deliberately paced as any of the aforementioned films. The film possesses all the elegant visual stylings of past Ghibli films, with its lush, grassy knolls and exquisite attention to detail. If there’s one particular aspect that I found particularly grating about The Secret World of Arrietty, it’s the rather obtrusive nature of its dubbing. English dubbing has never been much of a problem for me with past Studio Ghibli films. I prefer the English dub to My Neighbor Totoro to its Japanese track, and seeing Ponyo in theaters a few years ago in English was a great experience. The problem with the English dubbing stems from the lethargic way in which the voice-actors realize their characters. While Bridget Mendler is passable as the titular character and Amy Poehler shines in her bit role, the remaining cast shuffles through their lines without the slightest variation in vocal pitch. This becomes particularly problematic as the narrative begins to take shape. While Miyazaki’s films rarely have distinct heroes and villains, The Secret World of Arrietty does have a fairly clear antagonist. Unfortunately, the housekeeper Hara (Carol Burnett) moves into the antagonist role without the slightest sense of purpose. Her hunchbacked appearance serves to underscore her menace, but otherwise, her malicious behavior feels quite jarring in a film that really never demands it. The formal elegance of The Secret World of Arrietty is up there with the best of Miyazaki’s films, but the narrative is too slight to leave much of a lasting impression.